It’s June 2018 and summer travel season is underway! We've curated our list of must have travel accessories to travel smarter and safer! It’s 2018 and staying connected is a MUST! Especially after taking those Instagram worthy photos that you know you’re gonna want to post right away. The SkyRoam Solis keeps you and 5 of your devices connected in 120 countries and counting! You can pay as you go for only $9 per day. It also doubles as an extra battery pack so you can charge your devices on the go. This is the ULTIMATE travel companion. How you ask? The Nomatic Travel Pack will keep you organized and gives you expandability on the go. Some of our favorite features are the RFID protected pocket, some of the individual zippers can fit luggage locks, magnetic water bottle pockets, and an expandable zipper pocket to make room for those souvenirs. There are so many perks to owning this backpack. AirPods are A MUST! They're portable, hands free, wireless, and long lasting with quality sound. And are perfect for pairing with the Apple Ecosystem. After doing tons of research and reading reviews, I went for the B Cozzy neck pillow and absolutely LOVE it! It's every thing as advertised. COMFORT for all you side and belly sleepers. You can snag one of these on Amazon or at your nearest Bed Bath and Beyond. The Anker is a trusted brand by the tech community. It's long lasting and quickly charges multiple devices. Dependable and reliable on the go. You can get yours at Amazon or your nearest Best Buy. Alright alright, I know what you’re thinking “a fanny pack? How old school is that?” Okay hear me out. They're the next big thing. E V E R Y O N E who dances definitely has one and I'm sure the trend is carrying on. Personally, I have a new found love for a small fanny pack for travel days. Why? CONVENIENCE. It’s a quick access pouch for all of those essentials and just in case items. It’s small enough to put in the seat back pocket. It helps while waiting in line for security and eliminating the need to rummage through your bag. Hip tip: Throw the fanny pack over one shoulder and rock it in front of you to eliminate the possibility of pick pocketers. What I usually pack: inhaler (asthma), chapstick, gum, passport, boarding pass, pen, tissue, wet wipes, AirPods, USB cable. Kevin and I have been using the Eagle Creek Pack It System since 2015 and we SWEAR BY THEM! It keeps you and your suitcase organized and not wrinkled - forreals. 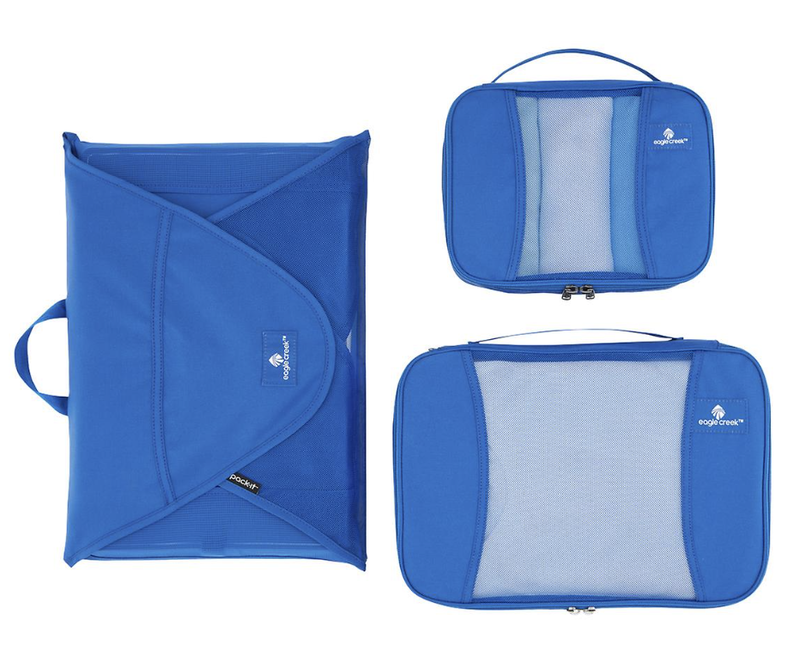 Eagle Creek's Pack It System goes beyond the Packing Cubes and offers toiletry bags and shirt folder. The shirt folder is a bit of a God send. Your shirts arrive to your destination nicely folded. They're definitely worth the investment. Usually shoe covers come as a one piece bag where you put your shoes in. What we really like is that Muji’s shoe cover is lightweight, compact and comes in 2 pieces so that you can save as much space as you need to. Muji has their own version of Packing Cubes which brilliantly fold into each other for easy storage. I personally still prefer Eagle Creeks Pack It system for a number of reasons (more durable, holds up more than Muji’s.) The shoe covers however, are our FAVE. They come in 2 sizes, Small and Large. It separates your dirty shoes from your clean clothes.